Thanks to Jason for the tip! SEATTLE, Thursday, Jan. 25, 2007 – Sonics General Manager Rick Sund announced today that the team has re-signed forward Andre Brown for the remainder of the season. Per team policy, terms of the contract were not released. Brown has appeared in seven games for the Sonics since joining the team on Jan. 5, averaging 5.0 points and 2.9 rebounds per game. Brown tallied a career-high 10 points vs. Milwaukee on Jan. 19 and recorded a key block in overtime of the Sonics 122-114 victory over Utah on Jan. 12. The 6-9 forward, who played his college ball at DePaul University, began the season with the Sioux Falls Skyforce of the NBA D-League. Not sure if anyone else caught the exchange between Lenny Wilkens and Kevin Calabro during the slaughter of the Bucks last Friday, but it’s emblematic of the misleading nature of even the smallest of win streaks. I’ll venture the minimum number of games needed to qualify for the playoffs in the West will be 43. That’s reasonable, considering the last time a team with fewer than 43 wins made the playoffs was 1998 (Houston, and I’m not counting the strike year, obviously). Right now, the Sonics are 16-25. In order for them to win 43 games, they’d have to go 27-14 for the rest of the season. In other words, in the next two months the Sonics would have to play as well as the San Antonio Spurs in order to qualify for the playoffs. That’s a joke. There is no way in holy hell the Sonics will play 13 games above .500 for the rest of the season. It’s just not going to happen. In fact, I’ll wager $500 against all comers that it won’t. Go to the comments section of this site and write your name and telephone number down. I’ll take all action. I’ll even give you 5-1 odds. The simple truth is the first half of the season counts. Yeah, it stinks Swift got hurt and that Rashard and Ray both missed big chunks of the year, but that’s life. The fact Rick Sund thought the best way to go at center was to back an inexperienced high school kid (Swift) with an inexperienced Frenchman (Petro) is his own doing. The fact he thought Earl Watson would be happy playing second fiddle when the very reason Sund was able to obtain him was because of his unhappiness in Denver is nobody’s fault but his. But that’s the past. The realty is the Sonics are now hopelessly out of the playoff race, and every game they win catapults them further away from Greg Oden and Kevin Durant, and closer to people like this. Hey, I’m all for the team trying hard, and I certainly don’t expect them to pull a fade a la John Lucas’ Cavs of a few years ago, but it certainly doesn’t make any sense for the Sonics to give Ray Allen 45 minutes a night, the way they have for the past week or so, when he’s 31, nearing the downslope of his career, and his team is actually better off losing. 1. Trade either Ridnour or Watson. Only a fool would try this 2-point-guard situation next year, when it’s obvious that both of them want to start. Starting next season, their salaries are basically identical, and their trade value is probably the same. In a perfect world, the Sonics would deal Watson for somebody like Jeff Foster, but that’s just a dream. 2. Continue to start Gelabale until Rashard returns, then make sure he – not Wilkins – is the first guy off the bench. I don’t think Wilkins is the answer at SF if Rashard leaves this summer, and Gelabale could be. The Sonics need to know what holes they need to fill this summer, and giving minutes to Damien at Gelabale’s expense doesn’t make sense. The problem in this whole equation is Bob Hill. At this point in time, Hill’s goals are at odds with the team’s. The best result for Bob Hill is to win as many games as possible, so that he has a better shot at coaching in the NBA next year. The best result for the Sonics sans playoffs is to lose as many games as possible, but that would result in Hill’s resume being sabotaged, a situation with which he is intimately familiar. As is often the case in the League, what’s best for the coach isn’t necessarily what’s best for the organization, and so long as Hill’s contract isn’t extended, it will remain that way. 1. Don’t extend Hill’s contract, and watch Allen play 45 minutes a night in a Quixotian attempt for the playoffs. 2. Extend Hill’s contract, and watch Petro get 30 minutes a night and Allen closer to 35. 3. Fire Hill, promote Sikma or another assistant, and watch the Sonics move down in the standings and closer to Odenville. Considering they’ll be going hat in hand to the legislature this year, I’m guessing #1 will remain the franchise’s choice. And, once again, Sonic fans will get the shaft. Now, in the dozens if not hundreds of times that Clay Bennett has mentioned how wonderful the Pepsi Center is, has he ever once mentioned how the Denver pro sports teams contributed $170 million to build it? Not to my knowledge, or else he wouldn’t be offering only $100 million to build a newer, more expensive building that will destroy the viability of KeyArena. Now, it’s entirely possible that the $100 million in city/private funds will include $70 million from Bennett’s associates, in fact Bennett even mentions that “we are continuing to do the work that will allow us to come forward with an acceptable level of contribution.” Of course, he also says that the reason the Sonics can’t contribute any more is because of the team’s poor financial position, while failing to mention that the horrific on-court product – given to us by the people that still run this team - is almost entirely responsible for that poor financial position. Further, he does not mention at any point who will be forced to cover the – inevitable – cost overruns. Nor does he mention at any point the irony of building new luxury boxes, which will inevitably sabotage the sales efforts of the Mariners and Seahawks, the same problem KeyArena and the Sonics ran into when their luxury box sales plummeted after the construction of Safeco and Quest Fields. But, hey, that’s a problem for the Seahawks and M’s right? Look, I’m all for the Sonics being in Seattle, I really am. But I am damned sick and tired of taxpayers being asked to fund projects for private enterprises for billionaires when there are scores of non-publicly financed stadiums across the country and when people in this city are sleeping on the streets. It’s a bluff, folks, and I pray the legislature sees through it in time. My message to Clay Bennett? Go ahead, move to Oklahoma City. Just don’t start crying when 8,537 show up three years from now to watch Mouhamed Sene fumble yet another entry pass in the low post while Ray Allen and his 36-year-old legs do a statue impersonation at the 3-point line. I apologize for the recent lack of posts, but in case you haven't noticed, it's SNOW-BLIZZARD 2007 outside, and my computer-typing fingers have been frozen. Also, the four-hour season premiere of 24 has been on the last two nights (Spoiler Alert: the world blows up!). So, in summary, I'm sorry. It won't happen again. Probably. Did I mention the Sonics won their SECOND GAME IN A ROW tonight?! w00t-w00t! The Sonics have sent Mouhamed Sene to Idaho. In other news, the Sonics have apparently decided the best way to lose is to lead in the first half and blow chunks in the second. After experimenting with the "fall apart in the 1st quarter and then pretend to mount a comeback" theory popularized by Bob Weiss last year and continued with Hill, they have now settled on the "look good early until the other team gets over its marijuana hangover from the night before and realizes they're losing to the Sonics" routine. It's worked well the past two nights, with equally depressing results. Depressing, that is, until you look at the standings, where the Sonics are currently only two losses behind Memphis for the most in the league, and the odds-on spot to grab Greg Oden. The Hawks are coming on strong, though, posting a 1-9 mark in their past 10 to rival Seattle's 2-8 spot. Unfortunately, the Sonics still have five more home games coming up on this homestand, with two of them aggravatingly winnable. Put simply, the Sonics are going to need to find new ways to lose. I suggest looking into Olden Polynice's whereabouts, or perhaps activating Danny Vranes from the taxi squad. The big story with the Sonics right now – other than their ability to take suckiness to new and previously unseen levels – is Earl Watson usurping the starting PG role from Luke Ridnour. Now, hey, I like a good usurping as much as the next guy, and Lord knows I’ve rattled on and on for more than anyone about how Earl is more deserving than Luke to hold the reins of this team, but with the Sonics playing the Suns tonight, I thought it might be a good idea to take a look at how Ridnour compares to Steve Nash, the White Man’s Favorite Basketball Player. Looking at the numbers, you can see Ridnour is in Nash’s ballpark for alot of the stats – with the notable exception of 3-point shooting, ironically the same demon which has propelled him to the bench this season. Bob Hill’s thinking is obvious: Luke Ridnour must start knocking down jump shots for him to be a starter in this league. Hill’s reasoning for benching Luke is, to me, a good one: Part of a being a good shooter is confidence, and until Ridnour figures out that he must take open shots he won’t be a starter. It’s important to know that Luke’s not being benched for missing shots, he’s being benched for not taking them. If Ridnour was shooting terribly (which he has been recently) and that caused the benching then I would disagree with Hill, inasmuch as that might destroy his confidence. But Luke’s a grown man now, and he’s being paid a grown man’s (actually, about 358 grown men’s) salary. He needs to start acting like it. And the Sonics keep losing. Phoenix, Dallas, Houston, Washington, Indiana and Sacramento. Not until they play the Hornets on Feb. 23 will the Sonics have a reasonable shot at winning a road game, which means the road skid could approach 18 games. Hill’s desperate move of benching Ridnour, Wilkins, and Fortson/Petro helped a bit in the loss to the Warriors, but I still get the feeling Hill’s time in Seattle is growing short. Honestly, I can’t see the Sonics winning any games – road or home – until they play the Bucks 11 days from now. I’m guessing I wasn’t the only one who knew little or nothing about Andre Brown before the Sonics signed him yesterday. Here’s a brief bio on the newest member of the roster, the man who will turn the Sonics into a playoff contender. (Seriously, Andre, no pressure). Spent the past couple of months with the Sioux Falls Skyforce of the NBDL. Currently leading the league in points and second in rebounds. Fantastic field goal percentage of 66; not so fantastic FT percentage of 55. Brown was selected as the 2nd pick in the NBDL draft in November 2006, ahead of Denham Brown, Troy Bell, Darius Washington, and a whole bunch of people even NBA geeks wouldn’t know. Still, he could’ve been picked behind those people, so he’s got that going for him. Brown also played in Italy and the Adriatic League (where he managed to hit 7 of 23 free throws! ), always having good rebounding numbers and decent scoring totals. You may not remember this, but Brown was in the Sonics’ training camp in the summer of 2005, before heading off for South Korea and the Philippines (for the Barangay Ginebra Kings!). Naturally, Brown dominated in the Philippines, inasmuch as he would have been the only person taller than 5’3” in the entire country. Brown’s most well known experience was for DePaul, averaging close to a double-double during for his four years in school. As could be expected, he shot poorly from the line and great from the field, culminating in a 57% FG/48% FT mark his senior year. He also averaged a couple of turnovers per game, which is another knock on his game (worth noting he’s averaged 3.1 TOs per game at Sioux Falls). He also set a Conference USA record with 27 rebounds in a single game back in the day. At 6’9” and 245 pounds, Brown isn’t going to destroy anyone inside, but he is a presence. I also doubt that he’s going to block any shots at the NBA level, since he never did in college. According to various internet sources, Brown is very fast for a big man, and has been likened to Kenyon Martin in his ability to run the break and play down low. Ironically, Brown was the second-best player at a pre-draft camp in Norfolk, VA. The best player? Desmond Farmer, the guy the Sonics just released to get Brown. Basically, I can see Brown playing a few minutes off the bench when the Sonics need a warm body – worthwhile for the team in that it will enable the Sonics to send Sene to the NBDL where he can get some minutes. Does this mean, though, that more moves are to come, like, perhaps, a Fortson trade? I don’t know. Unless the Sonics can get a big man in return, it doesn’t really make sense to trade Fortson, unless Bob Hill plans on starting Petro and giving up on the season (which, considering who’s available in the draft this year, may not be such a bad idea). 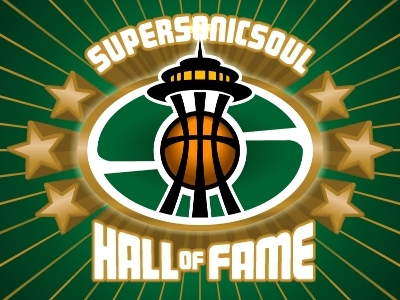 It’s sad, though, that what could turn out to be one of the Sonics’ final seasons in Seattle will be such a lousy year. Sad, but not entirely surprising. After the Seattle Sonics 10th straight road loss last night, the Bob Hill death watch has officially begun. Whether it's today or a week from now, Bob Hill is going to be fired. Despite repeated denials, Sonics vice-chairman (?) Lenny Wilkens (who happens to have the most wins in NBA history and coached the beloved '79 champs) is likely to replace him. As much as I love Lenny, I will miss Hill. He's a throwback to the angry, profanity-spewing, beer-swilling coaches of old, like Doug Moe and George Karl. And those kind of coaches don't cut it in the NBA anymore. Will Lenny the Legend make a difference? Probably not. For better or worse, authority figures today are largely ignored or mocked by anyone under 30. 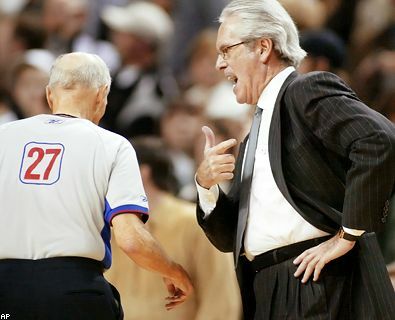 And unless you're a living legend like Pat Riley, it's near impossible to motivate young players by yelling at them. That's probably a good thing, but a makes for a damn boring coach. A new coach might light a fire under these Sleepy Sonics, and hiring Lenny or even assistant coach Jack Sikma would a be a nice touch for the 40th Anniversary, but whether it makes any difference down the road will remain to be seen. What's the opposite of a halftime pep talk? Because that's what we need to call what Bob Hill did last night - the Sonics were outscored by 6 points in the 3rd quarter and by 18 points in the 4th. With Chris Wilcox continuing to do his best to prove that I was right when I said the Sonics should avoid signing him, Hill is likely one more 3 point-4 rebound night away from dumping the $8 million man in Puget Sound with Andreas Glyniadakis tied around his ankle. To make things worse, the Sonics are in Houston tonight, where they will undoubtedly fall behind by 12 points in the first quarter, rally in the second, then put on a Mike Wilks Show in the fourth. Seriously, can anyone think of a reason why you would want to watch the Sonics tonight? The rumors are swirling that the Sonics are looking at NBDL players to fill a void at center, which has got to make you cringe, in that the Sonics have drafted big men with their #1 picks for the past three seasons yet don't have anyone ready to play the position right now. Oh, right, I forgot, Robert Swift was going to average 20 points and 11 boards this year. My bad. Is it "go time" foe Wee Wilks? Who do they cut on Jan 10th (the day contracts must be guaranteed for the rest of the season)? 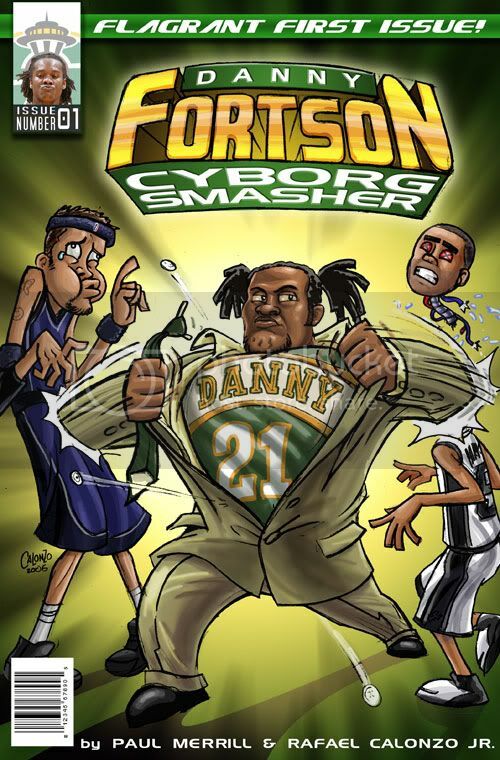 Is Danny Fortson really the starting center? Which is worse: Oklahoma City or RENTON?